In this brand new clinician book, authors Butler and Moseley take the neuroimmune science of pain further than ever before. 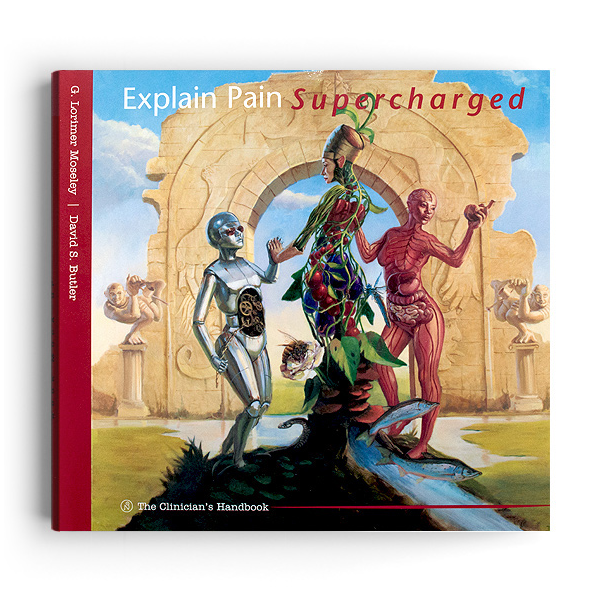 A completely new text for clinicians and anyone working with pain patients, Explain Pain Supercharged offers the latest background on neuroimmune science, conceptual change theory, and educational science; everything that is required to use the Explain Pain suite of tools to deliver optimal outcomes. Authors Butler and Moseley apply their unique style to take the neuroimmune science of pain further than ever before, providing a deep understanding of the neuroimmune biology of pain with over 100 ready-to-use clinical metaphors and therapeutic narratives. The book is extensively cross-referenced with Explain Pain and the Explain Pain Handbook: Protectometer so that you’ll be able to enrich your patients’ experience no matter where they’re at on their pain journey. Written by Associate Professor David Butler and Professor G. Lorimer Moseley. Absolutely a wealth of great information, and the latest research out there in the field. The authors did an amazing job of presenting and explaining the concepts in a way that is truly engaging. Many great principles I can apply directly to my practice but also just a great resource to have on hand for discussion and reference. I enjoyed the original Explain Pain so when I saw this was coming out I knew I had to add it to my neuroscience collection. For more information or to register for a course, visit the NOI website.